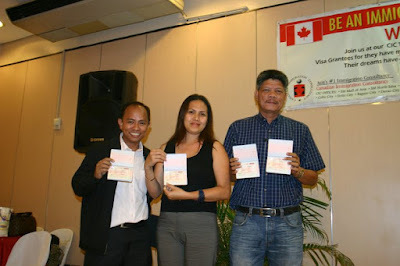 Legazpi City Seminar Schedule | Aug 14, 2011 - Gateway to Canada | Canada Immigration Consultancy! Mr. Emmanuel Zaballa, from the Albay Bicol, is now in Canada together with his family. Mr. Zaballa is an Electrical Engineer with several years of experience teaching college students. College Instructors were included in the priority list of occupations under Ministerial Instruction 1 (MI-1). Upon learning the opportunity, he immediately made a decision to apply. Good thing that he grabbed that opportunity because his occupation is no longer included in the current 29 in-demand occupations. Is your occupation included in the list? Interested to live and work in Canada? If you are from Legazpi City or nearby towns, this is your chance. Mark your calendar. On August 14, 2011 (Sunday, 1pm), we will be conducting a Live and work in Canada Information Seminar at PIPDC Review Center 3/F Rex Hotel Aguinaldo St., Legazpi City. CLICK HERE for seat reservation.